These little Spanish Microvelias thought September hot enough. Olé! Click for a picture of the larva (projected on the same scale in this picture). THIS AMUSING LITTLE BUG ROUTS IN THE OVER GROWN BORDERS OF DITCHES AND OTHER SMALL WATERS. Because of their small size (less than two millimeter) they are quite unknown, in most countries they only have their Latin name. Yet they may catch the eye because they often swarm in numbers on the surface along the borders. The scientific name means: "(very) small Velia", so it is classified as a micro version of the Water cricket, a bigger bug with a much slimmer body. 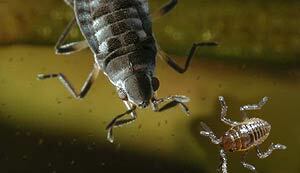 There are similarities: Microvelias can also be found on small streams and they have the backwards bended legs. Microvelia has legs which are all more or less of the same length and are moved alternating, in that way the tiny bug is trotting amazingly fast over the water surface. You have to use a magnifying glass to see something more of Microvelia's details. There are some species in Europe which are difficult to recognise, they have an oval shape. Most off the time they are wingless(a-pterous), from time to time fully winged (macro-pterous) specimen take care of the colonisation of waters that are further away. When magnified they are handsome creatures to look at, some specimen seem to have silvery fur collars. But just like Water striders they are aggressive little hunters, that put their sharp sucking snout in everything that's eatable. On one of the pictures on the right an unfortunate springtail has fallen a victim to a Microvelia. 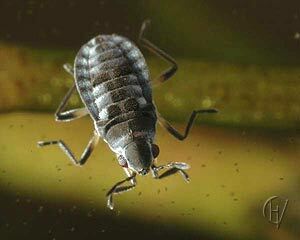 They also like to prick water-fleas (especially ostracods) that do come near the water surface. Bigger prey is sometimes encircled with Microvelias, who try to keep other guests out by making kicking motions with their hind legs. Microvelias mate the whole summer long and lay there eggs in rows on floating plants. 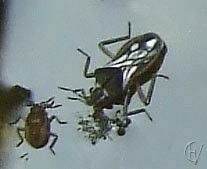 The very small larvae turn become imagos after five instars.